Wowwee!!!!! Look at that! A whole year’s worth of Texas chicken FREE!!!! If only I had see this ad earlier, I might have gone down to the Expo to have a shot at it. 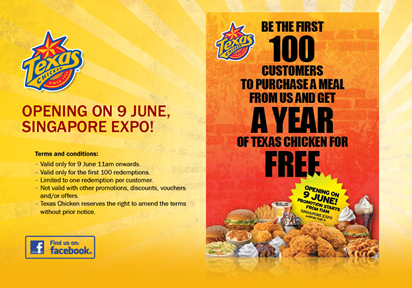 Last Sunday, the Straits Times had a short article on the opening of Texas Chicken at Singapore Expo. Apparently it used to be in Singapore and was located at Wisma Atria. A friend of mine told me he remembers eating at Texas Chicken in 1984! Why did these chain restaurants choose to pack up and leave so many years ago, and then make the come back again now? First it was Wendy’s, and now Texas Chicken, both of which I was too young to remember what they were like last time (hee hee hee). My good blogger friend Tiny Island mentioned that Denny’s should come back to Singapore again. This I fully agree. I do remember Denny’s. There used to be one outlet at Marina Square I believe (near where Carl’s Junior is now). I don’t know if there were more outlets. I never did dine at Denny’s when it was in Singapore, my parents’ don’t believe in giving children junk food. But I did try Denny’s in the US, and it was pretty good for the prices charged. 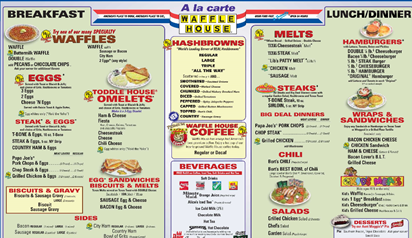 I really hope to see Waffle Ho use and IHOP International House of Pancakes in Singapore. I’d always go for the steak and eggs even at 2am at night. Waffle House would always serve 2 pieces of sandwich toast with lot’s of butter. It was enough to chase any blues away. Are we ready for such Americanised restaurants? I suppose we are more than ready when you look at the teens of today. Some young people I know feel shy to admit they like to eat rice! And while we are on the topic of American food, one thing I would really like to see more often is biscuits and gravy. The American version of biscuits. Looks like a scone but more savoury. The only place I know you can get biscuits in Singapore is Popeyes. I tried the biscuits at Popeye’s once at the airport. Quite good, but the ones in the US were just a tad bit better! Even McDonalds served biscuits. We have McMuffins here, but in the USA, they also have McBiscuits where they replace the bun part with the biscuits! It was crumbly, buttery, savoury and so so delicious for breakfast. Does anyone know where else we can get biscuits in Singapore? At the moment by fave chicken in Singapore is Popeyes 🙂 Oo thanks for the post…I can look out for Texas chicken now (never tried it before). I also love Wendy’s chicken sandwich and fries. Somehow their chilli sauce is better too. I always look forward to more US chains setting up shop here. IHOP would be great and my partner has been raving about Krispy Kreme. I like the Popeye’s biscuits (never tried US version), mashed potato and corn. I also love Kenny Rogers for its corn muffin, mac and cheese and BBQ chicken wrap thingy……all super laden in calories, but oh so good! I am so hungry right now!!! Yes I love kenny’s corn muffins. So good! Guess we are fans of soul food! I tot J’Cos might have a donut that tastes quite like Krispy Kreme, but I think J’Co’s standards have fallen. Fish & Chips is still the best with lots of tomato sauce and no mushy peas! Mmmmm monganui’s fish and chips are the best! Open a fish n chip store and I’ll patronise, in the meantime, you’ll have to contend with Long John Silvers! I actually had really good beer battered fish and chips at the Reds Cafe that has since closed down. I didn’t ever get to go there despite being a man u fan…Wasn’t there a planet hollywood around there too? yeah, i think that closed down earlier.